If you're going to buy a $200,000 sports car like the Mercedes-Benz SLS AMG, what's the point in settling for a base model? Perhaps this is the thinking behind the company only selling the new, more powerful SLS AMG GT in the United States during the 2013 model year. Please complain about only being able to buy the 583 horsepower version. I dare you. 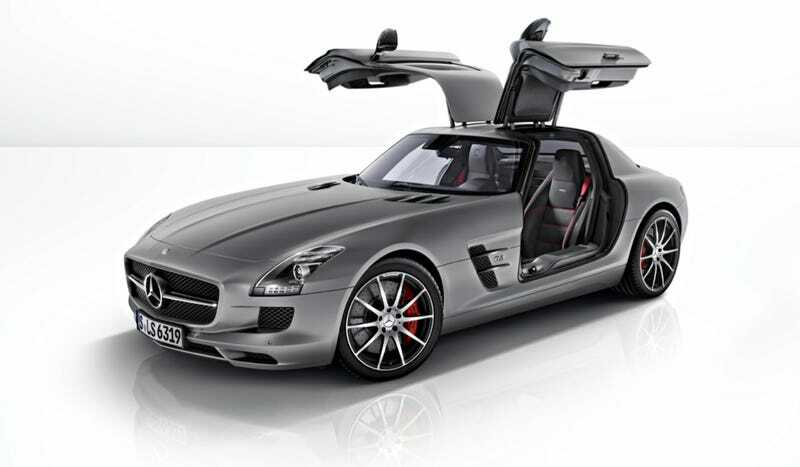 The 2013 Mercedes-Benz SLS AMG GT represents a pleasant reversal of history. Formerly we'd always get the base model, but be deprived the fastest version. This car is quite the opposite. Power from the massive 6.3-liter AMG V8 now reaches 583 horsepower at 6800 RPM (up from 563 the previous year), routed through a SPEEDSHIFT DCT 7-speed with a more aggressive and quicker "M" manual mode. Engineers have also tweaked the electronically controlled dampers for a stiffer and more dynamic feel compared to the 2012 SLS AMG. Mercedes would like you to use the "Sport plus" mode when racing at Hockenheim if you plan to achieve your ideal lap time. If you've put out the scratch for the SLS AMG GT, maybe go a step further and add the AMG design STYLE interior package. It's only money and how will you explain to your friends that you've passed up the porcelain Alcantara seat piping in contrasting colors? What are you, a socialist? The SLS AMG GT goes on sale this year and is available in both coupe and clearly-I-missed-the-point-of-Gullwing-doors roadster versions.